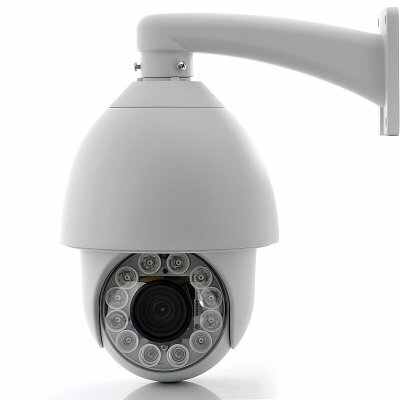 Successfully Added Weatherproof CCTV Speed Dome Camera "Hawk" - 480TVL, 27X Optical Zoom, PTZ to your Shopping Cart. 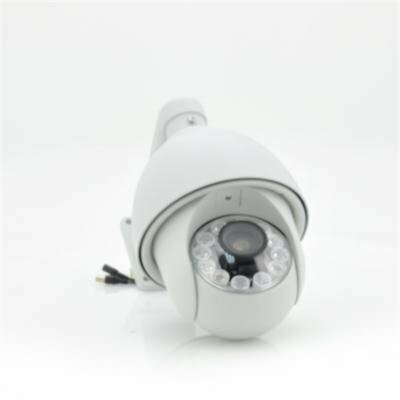 Weatherproof Speed Dome CCTV Camera with 480TVL resolution, high IR nighvision, 27X Optical Zoom and PTZ for a great and affordable way to get a high spec camera to enhance any security areas. Watching from the skies and having the ability to zoom in on anything that catches it’s attention is this “Hawk” security Speed Dome IR CCTV camera. Capable of rotating 360 degrees around on its axis and at a speed of 200 degrees per second as well as a vertical tilt of 180 degress, the “Hawk” can search and identify it sees. To keep the images always sharp and in focus, the auto focus lens will kick in automatically and provide sharp 480TVL resolution video. Equipped with 14 high end IR LEDs, even night time security recordings will be crisp and clear. This optical zoom CCTV camera is also weatherproof, so even when the Heavens open the "Hawk" will not be defeated and will continue with its patrol. Not even a mouse in the long grass will be able to escape the “Hawk” weatherproof security camera’s view due to the 27x optical zoom lens that provide high quality images without data loss even when completely zoomed in. The “Hawk” has a horizontal resolution of 480 TVL, which means the picture is created by electron beam scanning from the upper left and moving horizontally to the right and moving down until it reaches the lower right of the screen. 480 TV lines mean that it takes 480 scans to get the job done and this is repeated to produce a clear image. The “Hawk” has preset rotation and scanning directions, you’ll be able to set up to 4 different viewing positions on the “Hawk” which then each can perform up to 100 customized movements to scan the whole area. Patrol the area with reassurance knowing that the “Hawk” is ready to zoom on anything. This product is in stock and can be dispatched within 24 hours of ordering with a 12 month warranty. Brought to you by the leaders in wholesale electronics and CCTV cameras, Chinavasion. Great Camera! very happy with the product the camera is clear, night vision is fantastic and the overall product is of a high standard. Thanks again chinavasion.